Origin and Habitat: Mexico (Guerrero, Morelos, Jalisco, Michoacan). Population size varies across the range (likely with elevation), and the species can be abundant or rare. Altitude range; 1.000 - 1.600 metres above sea level. Habitat and Ecology: The species occurs in oak (Quercus) forests. In some areas the species is threatened by subsistence and seasonal agriculture. 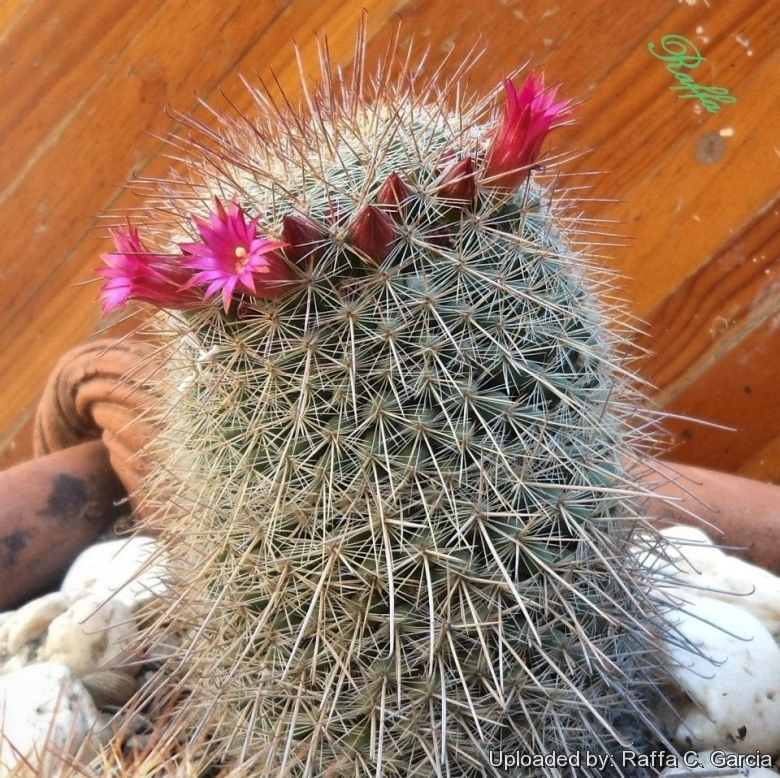 This cactus is locally used as an ornamental plant. 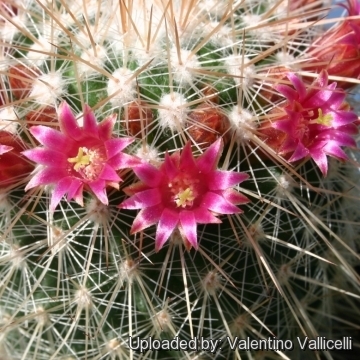 Description: Mammillaria nunezii is a solitary or occasionally clustering cactus with showy flowers in June. It is somewhat variable in habit and has a dense spination. Two subspecies are recognized, the nominate subspecies and subspecies bella (Backeb.) D.R.Hunt. Stem: Robust, globose to cylindrical, pale-green to grey-green , sunken apically, 6-9 cm in diameter and up to 15 cm tall. Without latex. Tubercles: Conical to bluntly four-angled, about 7-9 mm long and 5-7 mm in diameter, closely set, terete in section. Axil: With silky bristles and some wool. Areoles: Large, white and woolly. Radial spines: 10-30, stiff, slender, the uppermost being the shortest white, widely spreading, (3-)5-7 mm long. Central spines: 2-4(-9), unequal usually straight, but one may be hooked, reddish-brown or brown with blackish tips, (7-)10-15 mm long. 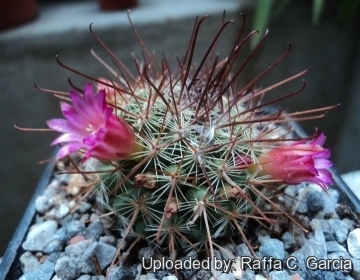 Flowers: Funnelform, deep pink to magenta 12-15 mm in diameter, narrowly opening. Stigma-lobes green. 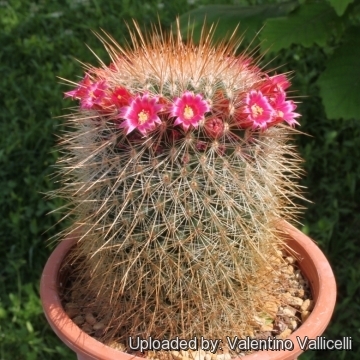 Blooming season: It flowers with the freedom of Mammillaria spinosissima, in early summer. Fruits: Club shaped, greenish white tinged with pink, to 25 mm long and 6-8 mm wide, ripens 12-14 months after flowering. Seeds: Small brown, round to club-shaped, 0,9 mm long and 0,8 mm in diameter. 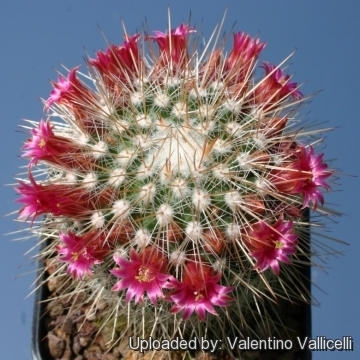 Mammillaria nunezii (Britton & Rose) Orcutt: (subsp. 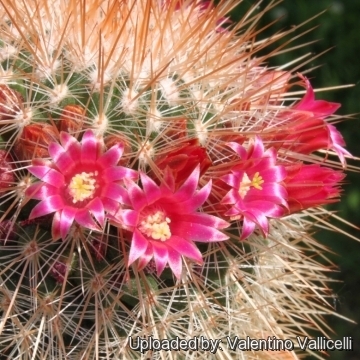 nunezii) It tends to cluster and has 2-9 brown central spines and magenta flowers. 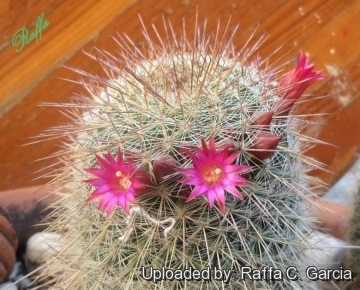 Mammillaria nunezii subs. bella (Backeb.) D.R.Hunt: It stays usually solitary and has 4-6 white central spines with red tips. Flowers are carmine. 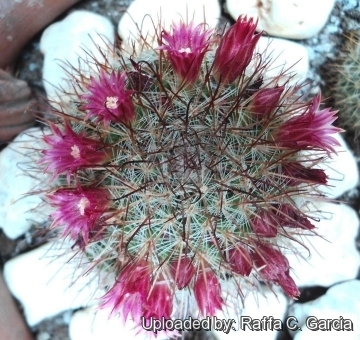 Mammillaria supraflumen Repp. : It is usually solitary, but occasionally forms offsets. It has fewer spines. 1) Arias, S. & Arreola, H. 2013. 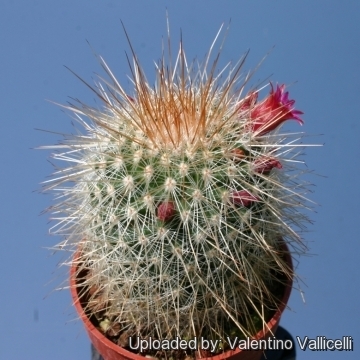 "Mammillaria nunezii." The IUCN Red List of Threatened Species. Version 2014.3. <www.iucnredlist.org>. Downloaded on 30 January 2015.